Saturday was a pleasant but somewhat atmospherically unsettled day, alternating between warm sun and chilly gray as a northerly breeze blew scattered, dark, but non-rainy clouds across the sky. After looking at UAVs, we dropped by Bartholdy Park and the Summer House to take in some garden ambience. 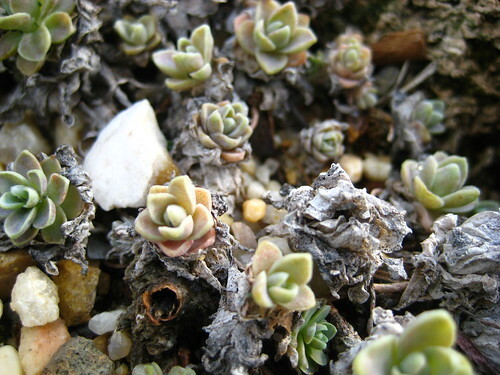 The large photo is of hens and chicks growing in a tray of succulents at Bartholdy. There’s also one non-garden photo above: the study of James A. Garfield’s monument silhouetted against gray stratocumulus clouds. Update: Aforementioned monument/clouds photo is in today’s DCist morning roundup. Hurrah for the ambidextrous preacher president who could write in two classical languages with either hand simultaneously.